By now everyone is familiar with the concept of secondhand smoke and the dangers that it presents. What many people may not realize is that thirdhand cigarette smoke that can be harmful as well. Thirdhand smoke is the particles that linger from cigarette smoke. These particles can remain on surfaces for years. What’s more, there’s evidence that these particles can be sucked into your home’s HVAC (heating, ventilation, air conditioning) unit and then spread around your home. Studies are just beginning on the effects of thirdhand smoke. However, the information already gathered over the last decade shows that thirdhand smoke does contain toxic and/or cancer-causing chemicals. HVAC units come into play by moving these particles around a room or home. This means that any designated outdoor smoking area that is close enough to a building could let in smoke particles that can then be sucked in by the HVAC unit and then circulated around the building. Unsurprisingly, the easiest way to avoid thirdhand smoke is to not smoke, but this is easier said than done for many long-term smokers. The next best solution is to smoke as far away from doors and windows as you can outside. 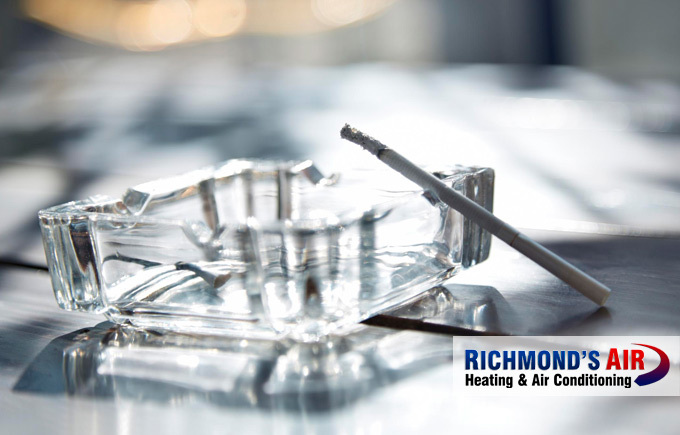 If going outside to smoke isn’t an option for you, there are still some things you can do to help keep your home and HVAC unit cleaner. Air filters are the first line of defense against the particles flying around your home. They’re good at trapping things like contaminants. Once your air filter has filled, it will let particles slip through. If you’re diligent about changing your filters, it should go a long way to making your home’s indoor air quality cleaner and healthier. There are two main types of air sanitizers. Some work to chemically eat odors in a space, while others that clean naturally such as baking soda. Consider buying some for your home if you’re concerned about thirdhand smoke. Periodically dusting your home’s surfaces can eliminate some of the particles that would otherwise be picked up and circulated around your home. While you’re at it, make sure to vacuum, too. These particles will also accumulate in your carpeting. After all this cleaning, you should also consider cleaning your HVAC ducts. This is also important if you’ve recently quit smoking because your ducts will still have contaminants and/or residue in them. If you require making sure your home’s HVAC system is clean and efficient, don’t hesitate to contact us. Richmond’s Air offers the best heating and AC repair service in Houston, Texas and beyond.